Five of Marvel's latest and greatest super sensations take to the oversized page in larger-than-life adventures! Carol Danvers embraces a stellar legacy as Captain Marvel, Earth's Mightiest Hero! She's an inspiration to young Kamala Khan, on her own path to becoming Ms. Marvel - big boots to fill, but Kamala is an Inhuman shape-shifter! You won't believe Gwenpool: She was a comic book reader just like you...until she woke up in the Marvel Universe! In another world, a different Gwen, last name Stacy, was bitten by a radioactive spider instead of Peter Parker - and became Spider-Woman! 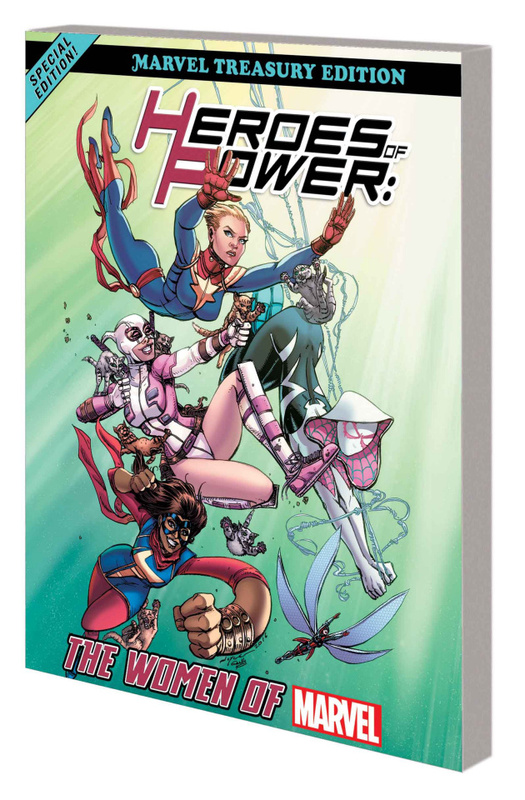 Plus: An all-new Wasp takes flight - but is she friend or foe to the Avengers? Collecting THE UNBELIEVABLE GWENPOOL #1, EDGE OF SPIDER-VERSE #2, MS. MARVEL (2014) #1, CAPTAIN MARVEL (2012) #1 and material from FREE COMIC BOOK DAY 2016 (CIVIL WAR II) #1.